Hurricane Michael was particularly devastating to the timber industry in the Central Panhandle. The Florida Forest Service has released a report quantifying the extent of the damage. As we move from emergency response, towards recovery there are a variety of resources available to help landowners. The Florida Forest Service and the Florida Forestry Association have both complied resources to help landowners begin to move through this challenging time. Perhaps the most sought after resource right now is contact information for loggers and consultants. This information is available through the FFS Vendor Database and the FFA Master Logger Contact List. 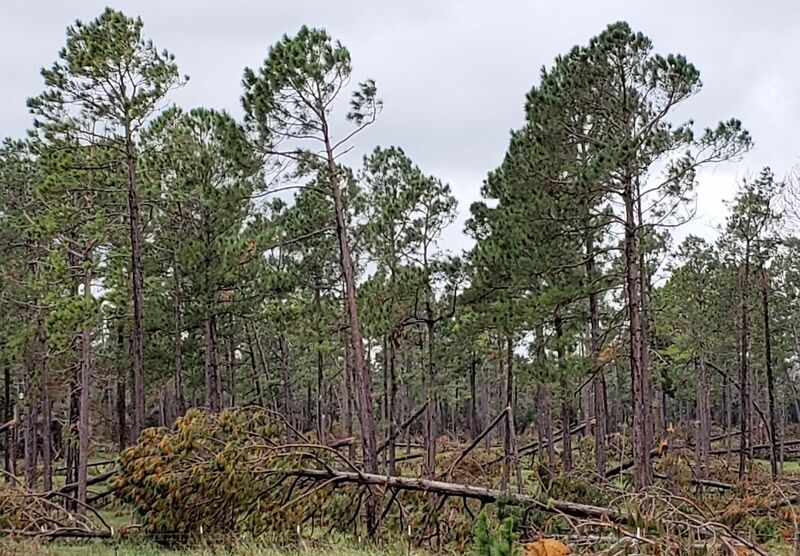 UF/IFAS Extension has released a new publication, Assessment and Management of Hurricane Damaged Timberland, to assist timberland owners navigate the plethora of post-storm challenges they are facing. Hurricane Michael left the area with an incredible number of downed trees. All of these trees are now potential fuel for wildfires. In areas, estimates are as high as 100 tons of available fuel per acre. As time passes and the fuel dries the risk of devastating wildfires increases. To help prevent wildfires there is a complete burn ban in effect for Bay, Calhoun, Gadsden, Gulf, and Jackson Counties. In other counties burning is only permissible with a Burn Authorization from the Florida Forest Service. Do Not burn without an authorization – it is unsafe and irresponsible. Throughout the impacted area, even after the burn bans are lifted, burn authorizations will be issued on a very limited basis; possibly only to certified burners. In an effort to increase the number of certified burners in the impacted area the FFS is offering two Certified Pile Burner Courses. Courses will be held at the UF/IFAS Extension Office in Marianna on November 27 & 28. Contact your county forester to register for the courses.